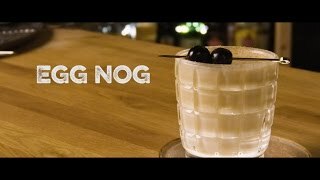 Eggnog is a creamy cocktail made of milk, sugar and eggs, as well as either brandy, rum or bourbon. It has a frothy texture thanks to the whipping of the eggs, and is usually finished off with a sprinkle of nutmeg or ground cinnamon. Served in a large punch bowl with a ladle, it is believed that it improves with age, and it can keep in the fridge for up to a year! Beat the egg yolks in a large bowl until they become lighter. Add the sugar bit by bit, whisking after each addition. Keep whisking until it is fluffy. 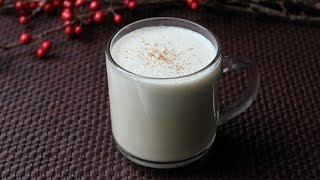 Put a saucepan on medium heat and add the milk and a pinch of cinnamon, along with two whole cloves. Heat until it is steaming, but do not let it boil. Then slowly add the milky mixture to the eggs, whisking as you do until the eggs are nicely tempered. Put the whole mixture back in the saucepan, and back on the heat. Stir with a wooden spoon to keep the mixture moving. The liquid should thicken, but it still should not boil as this will make the milk curdle. Take off the heat and add the cream. Strain into a bowl and allow to cool. 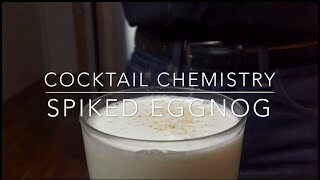 Then mix in vanilla extract, nutmeg, two tablespoons bourbon and two tablespoons rum, and chill in the fridge.